Heat oven to 325°. Season meat with salt and pepper. Place meat bone ends up in open shallow roasting pan; wrap ends in aluminum foil to prevent excessive browning. To hold shape of roast, place a small oven-proof bowl or cups in crown. Insert meat thermometer so tip is in thickest part of meat and does not rest on fat or bone. Do not add water. Do not cover. Roast 30 to35 minutes per pound or until meat thermometer registers 170°. One hour before meat is done, remove bowl from center of crown; fill crown with your choice of bread stuffing or see Regional Bread Stuffings (American Classics, Card 1). 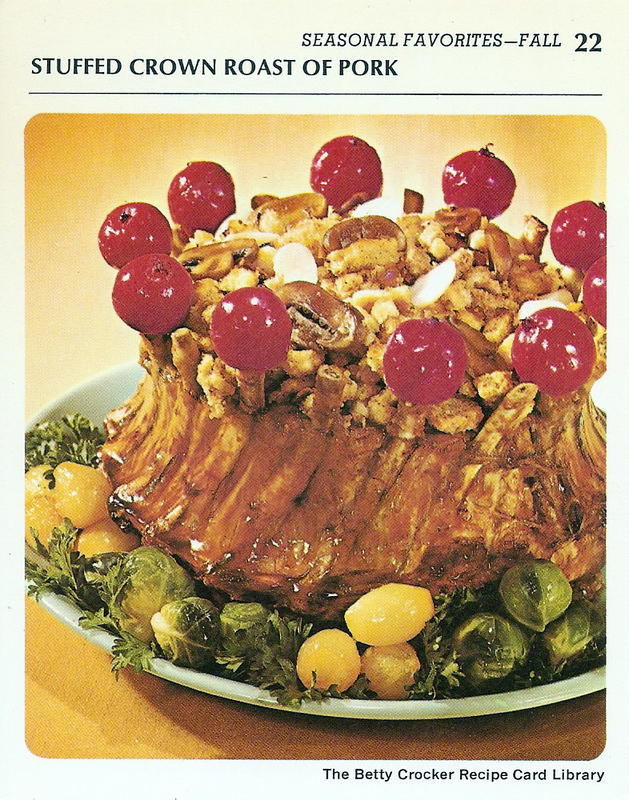 (Use about 8 cups stuffing for 8-pound crown.) Cover just the stuffing with aluminum foil during first 30 minutes. When roast is done, remove foil from bone ends and replace with crab apples or paper frills. Optional: garnish stuffing with sliced water chestnuts. To carve, remove stuffing to serving bowl; cut between ribs. 12 servings.